Jim Culloty, who as a rider won three Betfred Cheltenham Gold Cups aboard Best Mate, enjoyed his first Festival winner as a trainer when Lord Windermere landed the RSA Chase. "It was a peach of a ride by Davy (Russell). He wasn't getting any light and the horse jumped brilliantly - he actually tripped over the road and I thought that it might have cost us," said Culloty. "He is a good horse. We took the chance of not running over three miles all season because I didn't want to tire him out - I wanted a horse with experience but hadn't been bottomed - and it has worked. "I knew that he would like Cheltenham. I could have brought him here last year and he would have run a big race in a hurdle but we minded him because we wanted a big chaser, which is what he is now. "(Owner) Dr Lambe has been waiting a long time for this and, from my point of view, it's unbelievable. This is what it's all about. "It's very different from riding. As a jockey you get nervous half an hour before the race but as a trainer you are nervous for six months beforehand. You get up and feed the horses at 6am every morning and I always look to see how he is as he is the best horse I have. "I was a nervous wreck watching that. I was pacing and I went out to walk the course on my own earlier because I didn't want to talk to anybody. "I fancied this horse like mad and thought he would love it around here. I thought they would go a right gallop and I told Davy to hang on to him and ride him to get the trip, and if he got it I thought he would take all the beating. "They went quite steady and that probably suited us, but he was in a pocket and got no light throughout the race. He acted on the course and jumped well. He has the experience and I gave him a good few runs during the winter over shorter distances because I wanted to get the experience into him without bottoming him out. "Dr Lambe, who owns him, has been a massive supporter. My training career got off to a pretty slow start - it took me a while to get the hang of it - but he has been incredibly loyal and supportive. If I ever go and get a horse, he pays for it and he wanted a Cheltenham winner and we gave him one. "We'll celebrate tonight and then we'll think about the future. Where he'll start in the autumn I don't know, I suppose he could go for something like the Hennessy." Owner Dr Ronan Lambe added: "It's absolutely fantastic. It's my first ever winner here and I am delighted. Jim struggled a little bit to begin with but he has been doing fantastic recently with a small string. "It was a beautiful ride by Davy - the horse was cantering the whole way - and although he got tightened up rounding the bend, he kept calm and it was a wonderful ride. "I asked Davy if he was a Gold Cup horse for next year but he didn't answer. I would think that will be his target next year and Jim has always maintained he is a three-miler." Lord Windermere was quoted at 16/1 by Boylesporrts for next year's Betfred Cheltenham Gold Cup. Jockey Davy Russell took his tally at The Festival to double-figures after he guided 8/1 shot Lord Windermere to victory in the RSA Steeple Chase. Russell had to switch to the outside turning for home after being briefly boxed in but his horse responded well following the fall of Boston Bob to record a length and three quarters victory. "All credit to Jim Culloty and the lads. They have done a marvellous job with this horse and I only had to steer him today - he was in super order," said Russell. "I had loads of horse left under me and he just idled in front a bit as the line approached. I was almost upsides Boston Bob when he fell and I'm pretty sure we would have got past him. The race panned out fine but I had a couple of scary moments as he took a false step over the road out the back and then I was behind Tom (Scudamore) a bit longer than I would have liked turning for home. "I only sat on him for the first time last week and he schooled excellently. I didn't know his ability but Jim kept building me with confidence. Even this morning we had a little chat and he gave me free rein - he just felt that the horse was spot on. "Jim is a confidence guy. I have only ridden two horses for him on the racecourse and he has been spot on with both on them. His horses are in good health, he has wonderful facilities and he knows what it takes to win round here. He has a good way of thinking about things, which is a plus." Owner Dr Ronan Lambe was celebrating after his first ever Festival winner and could not praise his jockey enough. "It's absolutely fantastic. It's my first ever winner here and I am delighted. Jim struggled a little bit to begin with but he has been doing fantastic recently with a small string. Lyreen Legend's length and a three-quarters defeat in the RSA Chase by Lord Windermere put trainer Dessie Hughes in the runner-up spot for the second time in the afternoon. But though there were thoughts of what might have been for Tofino Bay in the opener, there were no regrets over Lyreen Legend's performance. "No excuses," said Hughes of the six-year-old. "We were beaten by a better horse on the day this time and we were absolutely delighted with ours. He's one of the youngest in the field and its all in front of him next year. In the shorter term we'll see how he comes out of today and maybe go to Punchestown." Rider Bryan Cooper was equally pleased with the son of Saint Des Saints. "He jumped and travelled great," he said, "and was just outstayed up the hill. But he's only a baby and he'll be better with another year on him." Champion trainer Paul Nicholls is still awaiting his first victory at the 2013 Cheltenham Festival, and while he saddled 5/2 favourite Unioniste in the RSA Chase the novice could do no better than fourth. Still only five-years-old, and the youngest horse in the field, Unioniste was beaten a total of nine lengths by winner Lord Windermere, leaving Nicholls hoping that his grey could improve with age. 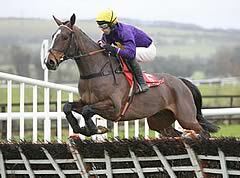 Nicholls said: "He was always struggling a bit and didn't jump as well as we know he can. When he won here in December he carried just 9st 9lb [with Harry Derham's weight allowance], and as I just said to John [Hales, Unioniste's owner], that race just dropped right for him. "Things were happening all a bit quick for him today. Maybe he's not quick enough, maybe he's an out-and-out stayer. He could be the type to take to the Hennessy [Gold Cup at Newbury], because he will get stronger, and when he does we'll be able to ride him differently. We didn't want to make too much use of him today because he's still young. It will make life easier when he's that bit stronger. "I cannot make them any quicker, but I'm sure in time he's got more to give. We'll probably give him a break now." The RSA Chase is run with its current title for the fifth time this year, although the race is backed by one of Cheltenham’s longest-running sponsors. It was known as the Royal & SunAlliance Chase up to 2008 and as the Royal SunAlliance Chase in 1997. Sun Alliance, which merged with Royal Insurance in 1996, previously backed the Sun Alliance Chase for 23 years and sponsored at Cheltenham for 26 years altogether. From 1971-73, the Foxhunter Chase was titled the Sun Alliance & London Foxhunters. Sun Alliance & London was the first company outside racing to embrace commercial sponsorship at The Festival. Only the tote precedes the insurance company. Before 1974, the race was titled the Broadway Novices’ Chase and the Totalisator Champion Novices’ Chase. There was no race in 1947 (snow), and 2001 (foot and mouth). The biggest field for the race was 30 in 1986 and the smallest eight in 1993. The current safety limit is 20. Dorothy Paget with three victories - Mountain Prince (1948), On View (1951) and Glenbeigh (1954). Fulke Walwyn was the most successful with four wins - Mountain Prince (1948), On View (1951), Glenbeigh (1954) and Mandarin (1957). Willie Mullins has the best record among current trainers in the contest, having celebrated three victories with Rule Supreme (2004), Florida Pearl (1998) and Cooldine (2009). Pat Taaffe was the most successful jockey with five wins - Coneyburrow (1953), Solfen (1960), Grallagh Cnoc (1961), Arkle (1963) and Proud Tarquin (1970). Ruby Walsh and Barry Geraghty are the only current jockeys to have won the race more than once. Walsh scored on Denman (2007) and Cooldine (2009), with Geraghty taking the honours on Star De Mohaison (2006) and Bobs Worth (2012). In 68 runnings since 1946 (some early races were divided), a total of 18 favourites (26 per cent) have prevailed. The biggest shocks were provided by 33/1 shots Canny Danny (1983) and Hussard Collonges (2002). Arkle was the shortest-priced winner when scoring at 4/9 in 1963. The oldest winner was 11-year-old Birthlaw in 1946. Five-year-olds Manicou (1950, Div 1), Arctic Gold (1950, Div 2) and Star De Mohaison (2006) are the youngest winners. 6.6s set by Miinnehoma in 1992. IRELAND (16): Coneyburrow (1953); Great Eliza (1955); Solfen (1960); Grallagh Cnoc (1961); Arkle (1963); Arkloin (1965); Herring Gull (1968); Proud Tarquin (1970); Ten Up (1974); Tied Cottage (1976); Antarctic Bay (1985); Florida Pearl (1998); Rule Supreme (2004); Cooldine (2009); Weapon’s Amnesty (2010) and Bostons Angel (2011). To this list might be added the name of Tied Cottage, winner of the RSA Chase in 1976 and the Gold Cup in 1980, before subsequent disqualification in the latter. The West Awake is the only horse to have won both what is now the Neptune Investment Managment Novices’ Hurdle (previously sponsored by RSA) and the RSA Chase. He won the Hurdle in 1987 and the Chase in 1988. The 2010 winner Weapon’s Amnesty became the first horse to win the Albert Bartlett Novices’ Hurdle and RSA Chase, a feat repeated by Bobs Worth in 2011 and 2012. Hollywood legend Gregory Peck owned the 1966 winner Different Class.